All donated blood are screened for the presence of Transfusion Transmitted Infection ( TTI ), so that they do not transmit infection to the recipient. In addition the blood is also grouped so that compatible blood types are given to the recipient. The first step in reducing the risk of transmission of TTI’s through blood transfusion is to select donors with no known risk of carrying agents of TTI. Such donors are usually voluntary non-remunerated donors, who do not have high risk behaviors or are exposed to individual with high risk behaviors. However, even with the most careful donor selection procedures, some donors who are carriers of TTI’s may fail to be excluded. In view of this, the laboratory shall screen all donated blood for markers of TTI’s. Therefore the final blood released for transfusion is as safe from TTI’s as the current testing technology permit. All donated bloods are screened for the following laboratory tests. Serological Screening Test for markers of TTI’s such as HIV (Human Immunodeficiency Virus), Hepatitis B virus (HBV), Hepatitis C virus (HCV) and Syphilis. Figure 1 : Prism Serological screening Analyzer. Serological screening test is to detect the presence of antibody or antigen of the TTI’s. ( confirmatory tests will be conducted if serological screening tests shown reactive results ). Nucleic Acid Amplification Testing (NAT) for HIV, Hepatitis B virus and Hepatitis C virus (for laboratory that has this facility). 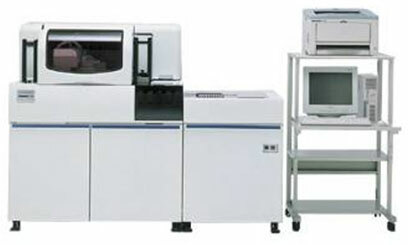 Figure 2: Tigris Nucleic Acid Testing (NAT) Analyzer. NAT is to detect the nucleic acid ( genetic materials ) of TTI’s. 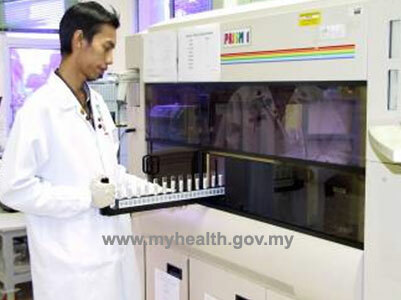 (Screening test for other infectious diseases may be carried out if deemed necessary). 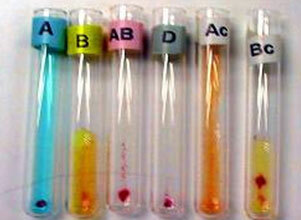 Blood Group Screening Test (ABO and Rh). To perform blood group test, 6 mL of blood sample is collected in a K2EDTA test tube. As for the screening and confirmation testing for infectious diseases, 8 ml of blood sample is collected separately in each of two K2EDTA gel test tube. Each collected blood sample is labeled with a unique/ special identification number and this number often follow the barcode number of the donated blood. Blood sampling will be done by a nurse / doctor / phlebotomist at the blood donation site. Blood samples will be collected into test tubes through the blood bags while blood was taking out through the vein in the blood donors’ arm. Blood samples that are collected during blood donation either at blood donation center or at blood donation mobile site) are sent to the respective laboratory for further blood testing. Serological Screening Test.This test is done to detect the presence of antibodies or antigens of HIV, HBV, HCV or Syphilis which are the main causative agents that transmitted through blood transfusion. Nucleic Acid Testing (NAT)This test is done to detect the presence of the virus itself by detecting the genetic material either DNA or RNA. This test is more sensitive and allows earlier detection compare to serological tests. This is because the antibodies take longer time to be detected compared to NAT testing, especially during the “window period”. However, in some cases for instances in chronic cases, NAT test may not able to detect due to low viral load but can be detected by serological tests. Blood Group Test (ABO and Rh).This test is conducted to determine the suitability of blood so that patients who receive blood does not has transfusion adverse effect. This test is done to detect the presence of antibodies that are produced by the person infected by the diseases as mentioned above. The antibodies take time to develop and may vary among infected individuals. For example, HIV infected individuals will produce antibodies between 11-22 days from the date of infection. This time frame is said to be at “window period” for HIV infected. For HBV infected, the time of detection by serological screening test is between 34-59 days, while for HCV infected are between 23-82 days. Confirmatory tests are conducted on cases where serological tests shown reactive results because sometime serological tests may give false reactive results. Occurrence of false reactive results may be due to the high sensitivity of the Serological Screening Test procedures. Nucleic Acid Testing (NAT) is performed to detect the presence of the virus itself by detecting the genetic material either DNA or RNA. 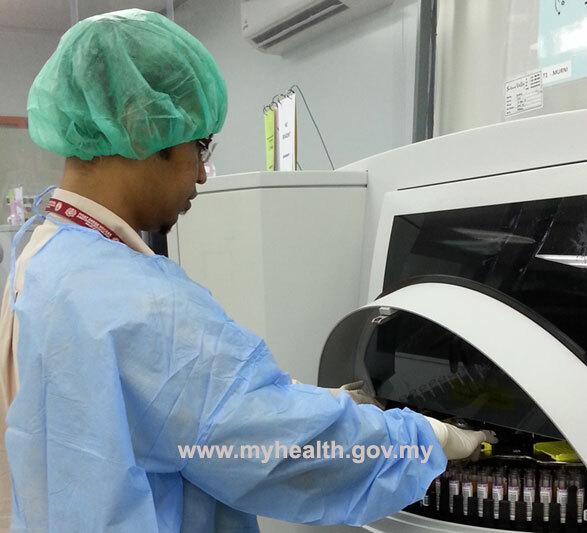 Three viral markers including HIV (RNA), HBV (DNA) and HCV (RNA) are detected. With this NAT, blood will be safer because it can detect virus early in the “window period” which can’t be detected by serological screening tests. HIV infection can be detected within 5 days from the infected date (time reduction of more than 50% compared to serological test). HBV infection can be detected within 15 days from the infected date (time reduction of more than 40% compared to serological test). HCV infection can be detected within 3 – 5 days from the infected date (time reduction of more than 70% compared to serological test). However, sometimes NAT can’t detect the presence of viruses due to low viral load or during fluctuation of the viruses, especially in patients with chronic stage of infection. 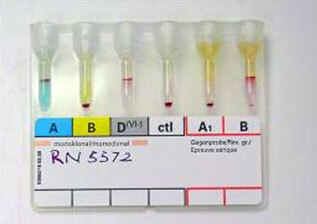 Thus serological blood screening tests and NAT are carried out simultaneously to determine the blood supplied is safe. Window period is the time period between infection and the time for the marker for that infection is detectable by the laboratory test. During this period the blood may contain agents of the TTI’s and can potentially be transmitted to recipient. When a donor is infected with a TTI, the marker for that TTI takes time to appear at detectable level in the blood. The window period for a TTI based on serological markers alone can be significantly reduced when NAT testing is also carried out. This is because NAT testing detects the Nucleic Acid (genetic material) of the agent of TTI. Nucleic Acids are detectable earlier than serological markers. Blood Group Test (ABO and Rh) are conducted on all blood donors because we need to know the blood group (ABO and Rh) for each bag of blood that has been donated. Therefore, only compatible blood with known blood group will be provided to patients. Donor with blood type O can give blood to all patients with blood type O, A, B and AB. Donor with blood type A can give blood to all patients with blood type A and AB. Donor with blood type B can give blood to all patients with blood type B and AB. Donor with blood type AB only can give blood to patients with blood type AB. Patients with blood type Rh Negative can only receive Rh negative blood from donors (except emergency or life saving situation). Whereas, patients with blood type Rh Positive can receive either Rh Positive blood or Rh Negative blood from donors. Table 1: Cross-match test to determine compatability between patient and donor’s blood. Figure 4: Blood grouping by gel/micro-column method. 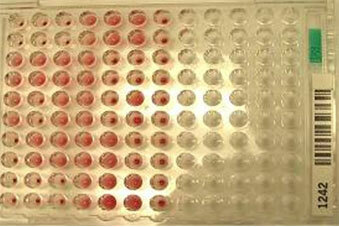 Figure 5: Blood grouping by micro titer plate method. Qualified, trained and competent officers such as Medical Laboratory Technologists (MLT) and Scientific Officers will conduct blood group test (ABO and Rh) and infectious disease screening tests on blood donated by donors. If the laboratory results are normal (infectious disease screening test is non-reactive), then blood donors will be notified by the medical officer during the next appointment or blood donation session. If the laboratory results are not encouraging (the screening test is reactive and the confirmatory test is positive for infectious diseases), then blood donors will be contacted by telephone to ensure that he/she can make an immediate appointment with a medical officer. Blood donors are not allowed to donate blood for a while (temporary deferral) or forever (permanent deferral) (dependent on the circumstances or the confirmatory test results) and will be given appropriate counseling and treatment by a medical officer or physician.